Hello my lovely readers, I hope the beginning of the new year is going smoothly for everyone. (If you want to get straight to the recipe, feel free to skip to the non-italicized text.) With regards to resolutions, this year I’ve decided to do something a little different. Alongside my usual set of running/baking/professional goals, I’ve decided to set a theme: mindfulness. Each month I am going to focus on being more mindful about something in my life. After reading the cookbook Run Fast, Eat Slow I have been inspired to make January’s theme into Mindful Eating. This doesn’t mean counting calories or following a list of restricted items, but it’s more about improving my relationship with food. It’s easy to feel guilty about eating (or not eating) certain things, to rush through meals in order to move onto something else, to just make things because they’re easy and fast and not because I’m particularly excited to eat them. This month I’m going to focus on food in a way that makes me happy, both mentally and physically: taking the time to make things from scratch as well as actually slowing down and enjoying what I’m eating; having fewer meals in front of a screen; enjoying decadent items as treats not cheats; focusing on what makes me feel happy and energetic and ready for the days to come. In light of that, today we have another recipe that I made mostly out of curiosity. Consistent readers (and anyone that knows me in real life) will know that I don’t bake anything dairy-free, gluten-free, flourless, or vegan with any amount of regularity because these are not food traits I personally find important. I am, however, often intrigued by such recipes and will make them on occasion just for funsies. The original recipe called for things I don’t buy, like self-raising flour, coconut sugar, and almond meal, but I followed her modification suggestions and made a few of my own to tailor the recipe for myself. I replaced some of the flour with ground oatmeal for a heartier flavor, nixed the almond meal in favor of chia seeds, and used regular ole’ brown sugar instead of coconut sugar. I cut the sugar way back since I was figuring the banana adds a fair amount of sweetness (and because I already have my favorite sweeter scones) and added some whole oatmeal for texture. A few weeks ago I found some cacao nibs on massive clearance, and bought two of the bags. They were a great addition to these scones, no extra sugar but a little bit of chocolate flavor to enhance the banana. However they are definitely not cheap so feel free to leave them out or use mini chocolate chips as a more decadent replacement. 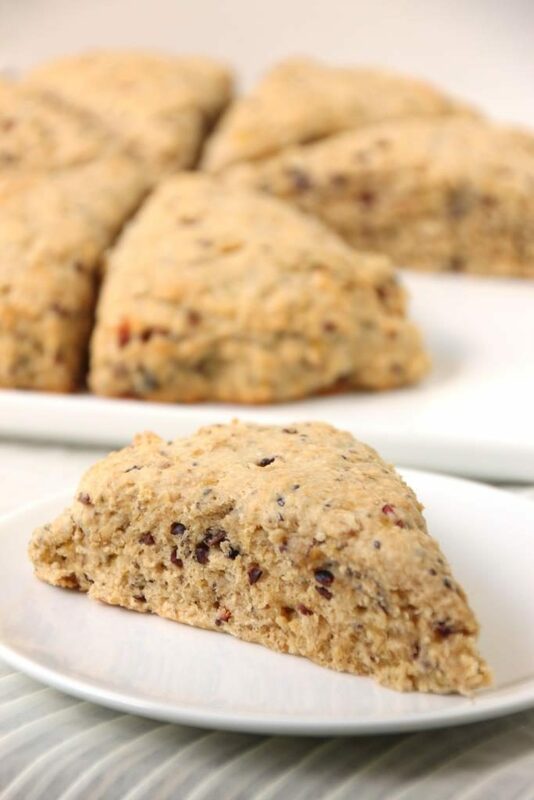 These scones are fairly dense but soft and moist and delicious. They are also pretty healthy, with low amounts of added sugar and a little bit of protein and good carbs from the oatmeal. Probably you shouldn’t eat three of them, but one is a perfect light-ish breakfast, especially when paired with a cup of coffee. I made these a few times and below is my favorite of those iterations. 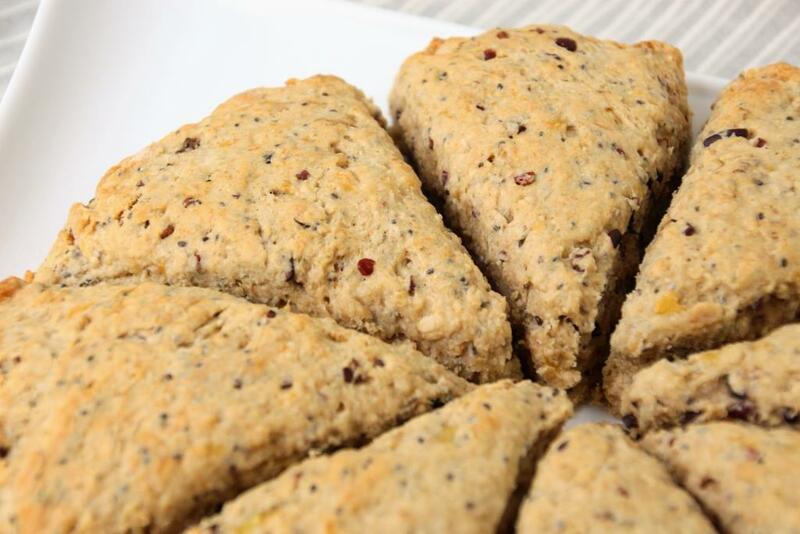 It can be baked into regular size or mini scones, depending on your preferences and whether you plan to serve them solo or as part of a fuller breakfast. They’re also easily portable and a great brunch option, although I think they’re best slightly warmed. The banana and oatmeal combination is delicious by itself or topped with any number of toppings. Jam or butter and cinnamon sugar were my favorites, but mostly I ate them plain. I especially like the less sweet version if it’s going to be spread with a sweet topping anyway, but you can definitely increase the sugar here if you prefer. Give these a try and let me know what you think, and if any of your friends could guess they were vegan. PS – These can be made gluten-free by using gluten-free flour and uncontaminated oats, and they are vegan/dairy-free unless you use normal chocolate chips, although I’m sure there are vegan/dairy-free versions of those out there you could substitute with. Preheat oven to 400 degrees Fahrenheit. Line a baking sheet with a silicon mat or parchment paper. In a large bowl, mash banana completely. Add coconut oil (microwave briefly if it’s not already mostly liquid), brown sugar, chia, and vanilla. Whisk until well combined, then let rest at least 3 minutes, or until chia seeds have softened. Add flour, both ground and whole oatmeal, baking powder, salt, and cacao nibs (or chocolate chips), and stir until completely combined. Mixture will be a little loose and quite sticky, but should be solid enough to hold its shape. Pour onto prepared baking sheet and shape into rounds about 1″ tall. 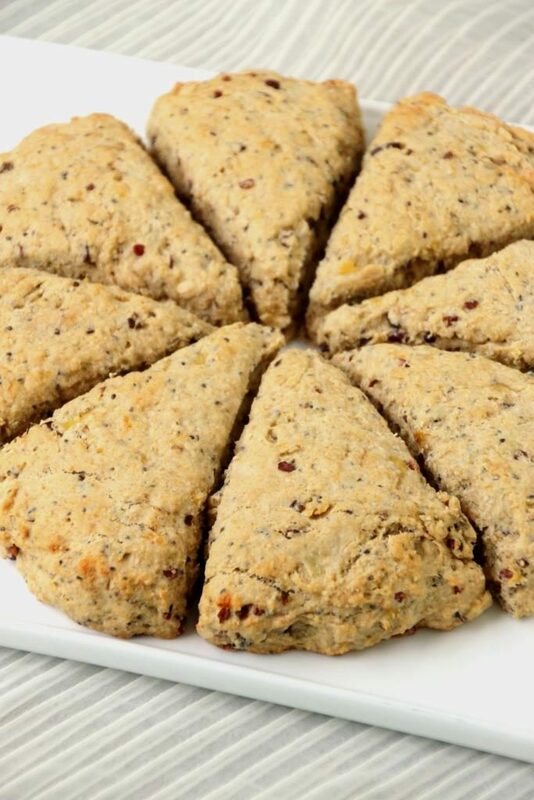 Use two rounds for mini scones, or one for large scones. Use a pizza cutter or a sharp knife to cut rounds into 6 or 8 wedges. Bake until golden on top and slightly browned on the bottom, about 20 minutes. Be careful not to over bake; they are better slightly too moist than slightly too dry. Serve warm. 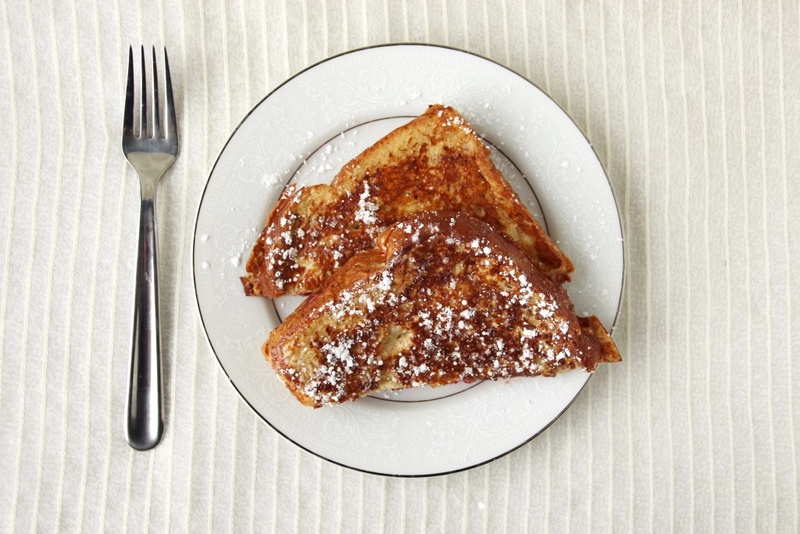 Great plain, with butter and cinnamon sugar, or your favorite jam. Store leftovers in an airtight container on the counter up to 3 days, but they are best on day one. 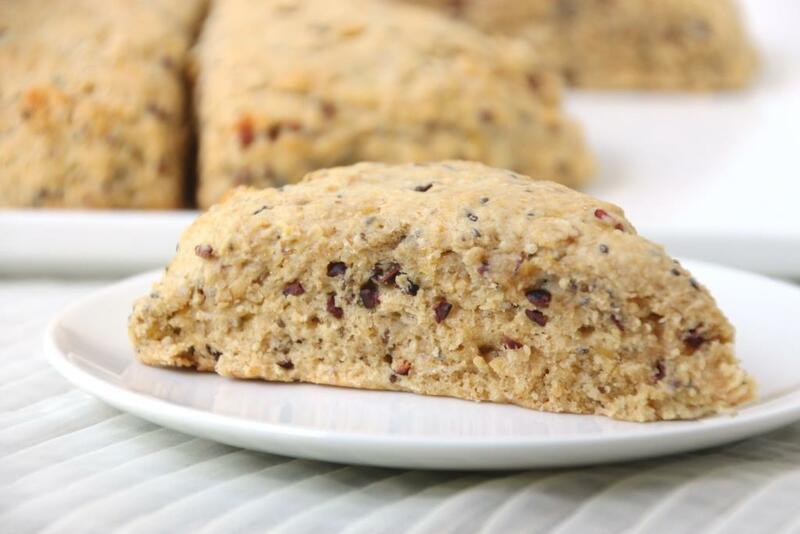 1 For sweeter scones, especially if you’re going to enjoy them plain, use the larger amount, or up to 1/2 cup. For less sweet scones, especially if you’re going to doctor them with jam, use the smaller amount. I personally like 1/4 cup best even plain, but the masses may prefer a sweeter option. 3 Cacao nibs are a great way to add a little chocolate flavor without the sugar and calories of chocolate chips. They are quite mild but delicious in baked goods. However for a more decadent treat, or if you don’t have cacao nibs on hand, you can substitute mini chocolate chips for delicious results, or leave them out entirely. Has winter hit your neck of the woods? It definitely hit Montana and it’s snowy and beautiful outside. I don’t know about you, but cold weather always instills a craving for cozy foods like soup and pot roast, hot chocolate and gingersnaps, oatmeal or waffles. Although working with yeast is rare for me, a few weeks ago I decided to make a batch of cinnamon rolls from scratch. 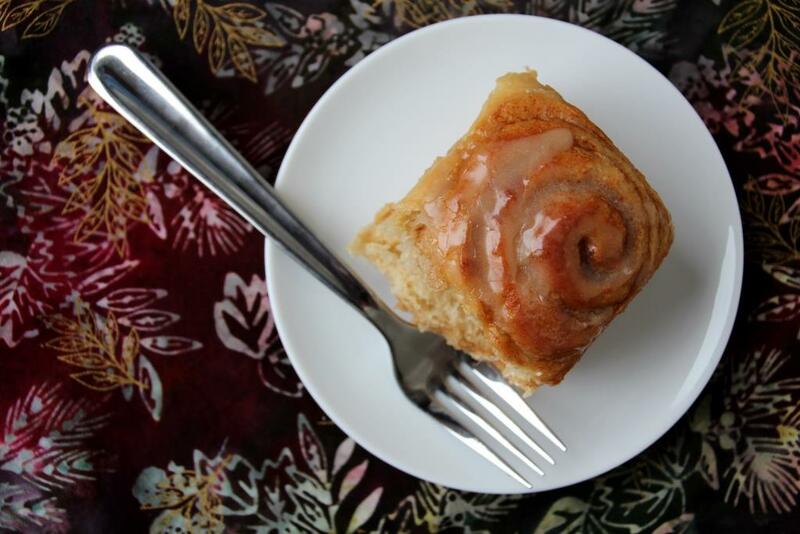 Cinnamon rolls are one of my favorite decadent treats, and it’s a good thing they are such a time-consuming endeavor or I’d probably make them a lot more often. I am very particular about cinnamon rolls, and don’t often even buy them for this reason. 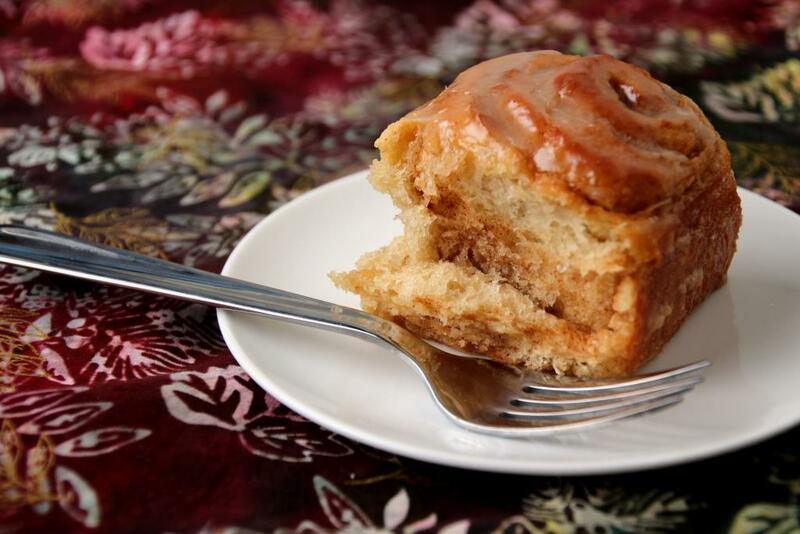 They must be soft both inside and out, heavy on the cinnamon and light on the frosting; a thin glaze is even better. I am not one for heavy frosting on much of anything, but I absolutely feel a quality cinnamon roll doesn’t need to hide beneath cream cheese and butter. 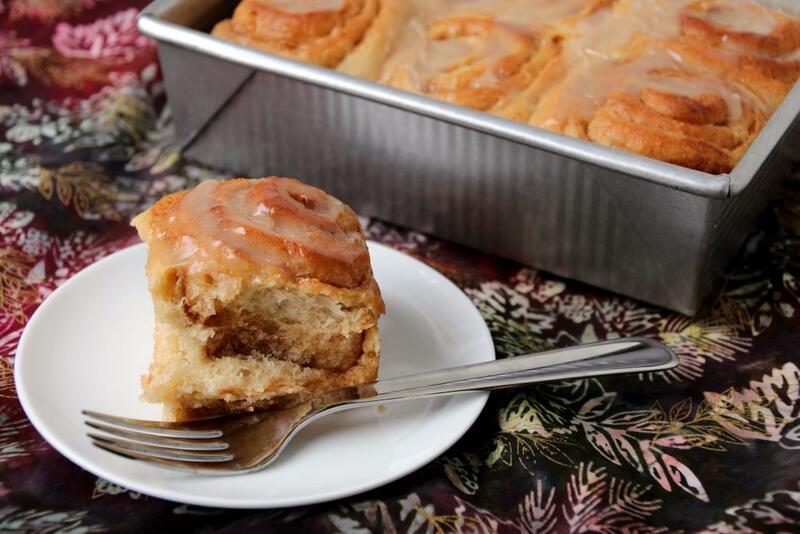 A few years ago when my parents came to visit for Thanksgiving, my mom and I made this cinnamon roll recipe. It’s everything a cinnamon roll should be, with the light flavoring of oatmeal which I find to be a wonderful addition. Like most yeast recipes, this one takes a few hours from start to finish, although most of that is waiting around for the dough to rise. 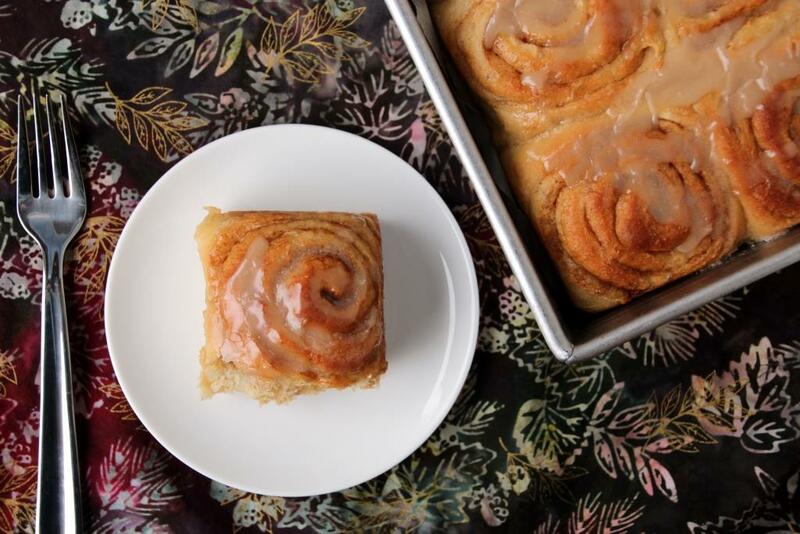 Nonetheless they result in pillowy rolls perfect for a cozy winter morning. 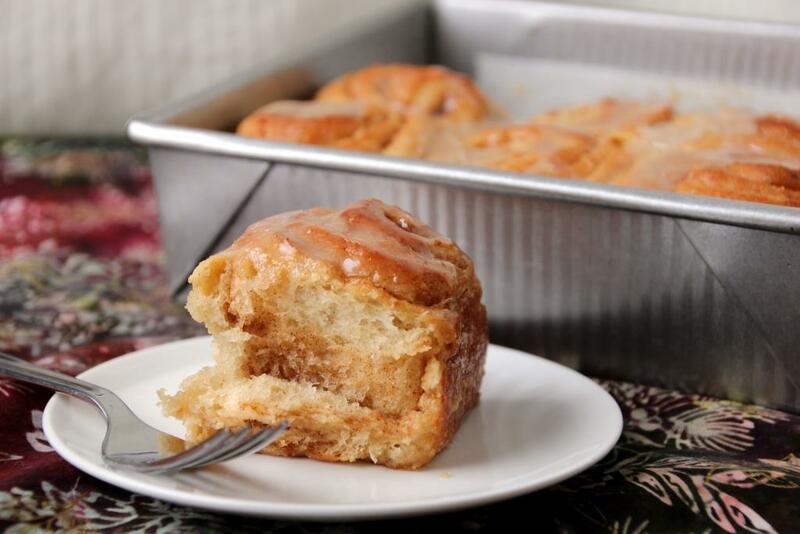 Full of cinnamon and drizzled with a light glaze, they feel a little lighter than your average out-of-the-can variety, and the gentle oatmeal flavor is unique but delicious. Served with some savory options like scrambled eggs or sausage, these would be perfect for Christmas breakfast to treat the family this year. 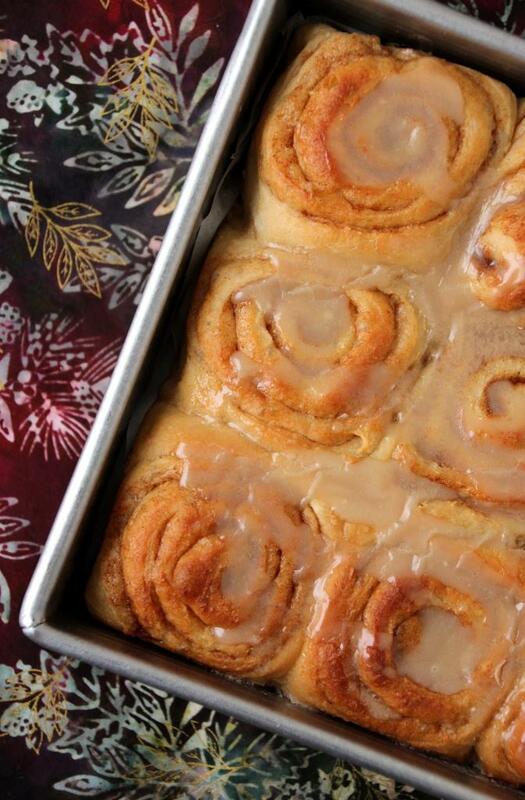 If you’re appalled at the idea of waking up *even earlier* Christmas morning just to make cinnamon rolls, never fear. I am definitely not suggesting you make a hectic morning even more so, but encouraging you to make these ahead for a simple breakfast that can bake while you open presents. Since it’s rare that I have a need for 12 large cinnamon rolls, I opted instead to cut my batch into 18 slightly smaller ones. I baked one set right away (because, yum) and put the remainder in the freezer. A couple of weeks later, I pulled them out, shoved them into a pan (with some difficulty; more on that later), and after letting them rise overnight, baked them up fresh in the morning with no more work than preheating the oven. All the delight with little of the work. You could make these up anytime between now and Christmas and pop them in the freezer until you’re ready for them, which is great for anyone that feels the holidays get even more hectic as the actual day draws near. If you go the freezer route, I highly recommend using disposable pans and freezing the rolls in the pan. Although it’ll take a little bit more space in your freezer, it means less work once you’re ready to bake them. In their frozen state I had quite the time getting them squeezed into a pan, and this effort can be easily avoided by just freezing them that way. If, like me, you try to avoid using disposable things when possible, or just always forget to buy them, you can line the pan you’d normally use with plastic wrap, place your rolls inside, and freeze the whole thing till the rolls are hard. Then you can remove them from the pan, wrap tightly in the plastic and put in a Ziploc, and still have your dish available for using. Splitting the batch into two pans of nine not only gives you a freezer batch ready for another day, but also results in slightly smaller rolls that are great for portion control or to be served alongside heartier additions. The next time you’re feeling up to a little kitchen challenge, make these rolls. I’m sure you and your family will love them. If you have leftovers, store them covered on the counter. The rolls are great reheated in the microwave for about 20 seconds, just enough to warm them up. Run the bowl of your stand mixer under hot water for one minute, or until the bowl feels warm. Add yeast to the bowl then gently pour in the warm water to dissolve. Let rest 10 minutes, or until foamed. Stir in milk, butter, sugar, egg, and salt (I do this by hand). Add wheat flour, oatmeal flour, and 3 cups of bread flour to the bowl. Using the dough hook, mix until well incorporated. Mix together brown sugar and cinnamon, and set aside. Butter or spray one 9×13″ pan (for 12 large rolls) or two 8×8″ pans (for 18 medium rolls). Set aside. Brush dough with melted butter, leaving one inch of a long edge clear. Spread sugar mixture evenly over the butter. As tightly as you can, roll up the long side so you end up with an 18″ cylinder. Bake for 20-25 minutes, or until golden brown and the center is 190 degrees Fahrenheit. (I highly recommend using an instant read thermometer for this!) If necessary, cover outer rolls with foil for the last 5 minutes, or until center rolls are done, to prevent excessive browning. Whisk together sugar, vanilla, and milk until smooth, then drizzle over hot rolls. Serve warm! 1 My favorite method for getting dough to rise consistently: Microwave a mug of water for 2.5 minutes. Move the mug to the corner of the microwave, add your bowl or pan of dough, shut the door, and let rise as usual. This keeps the dough warm and humid even if the rest of your house is cold or drafty. If you do this for both stages of rising, use new water each time to avoid super-heating it and having it explode. 2 Freezer option: Cut log into 18 slices. Either place 9 each into greased 8×8″ disposable pans (recommended) or set them onto a cookie sheet. Freeze until solid, then wrap tightly in plastic wrap and place into a Ziploc bag. To bake: Remove rolls from freezer and unwrap completely. Place into a greased pan if they aren’t already, then cover with a thin dish towel and let rise overnight (at least 8 hours). Bake until center reaches 190 degrees Fahrenheit, about 30 minutes. You may need to cover the rolls for the last 10 minutes to prevent over-browning while the center cooks through. With summer coming to a close tomorrow, perhaps your garden is overflowing with things to use or store. Although we only have a small garden, I did get an excitingly abundant harvest given its size. The raspberries were proliferous for several weeks (some are in the freezer to bake with this winter), green beans galore, a few delicious broccoli heads, a decent amount of potatoes, giant zucchini (hopefully still some more in the coming weeks), and for the first time ever, carrots! This is the third year in a row I’ve tried growing fingerling carrots, and the first year they grew bigger than my baby thumbnails. Planting them on the very edge so they weren’t overgrown by the beans seemed to be the key, and I’m excited to eat them. I planted two rows so likely will chop some up for the freezer. Roasted vegetables are my favorite and I’m sure we’ll be eating many panfuls in the coming weeks. My zucchini plant was not as abundant as some, likely due to the lack of sunlight my garden gets, but it still produced quite a few and there should be some more to pick if the weather doesn’t turn super cold right away. If, like many people, you have more zucchini than you know what to do with, then this is definitely the recipe for you. I see recipes for zucchini bread, muffins, scones, pancakes, waffles, etc, all over the place, but many of them are heavy on the sugar and chocolate. Although this is delicious, it somewhat ruins the health factor of the zucchini if you’re basically eating dessert bread. I recently came across this recipe on Pinterest (as usual) and loved that the chocolate was only in chip form, and the sugar content relatively low. 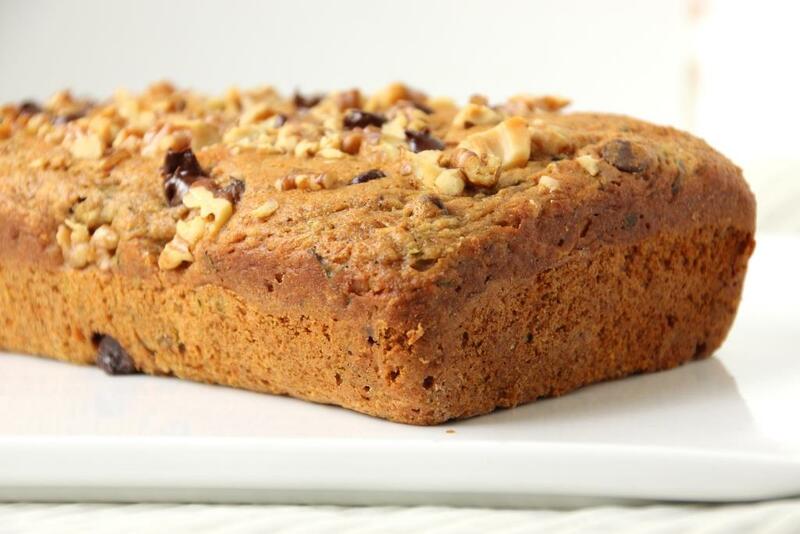 I made some modifications like I always do, and it resulted in a very tasty but much less sweet variation.The zucchini flavor is mild but the bread is warm and inviting with cinnamon and nutmeg throughout. 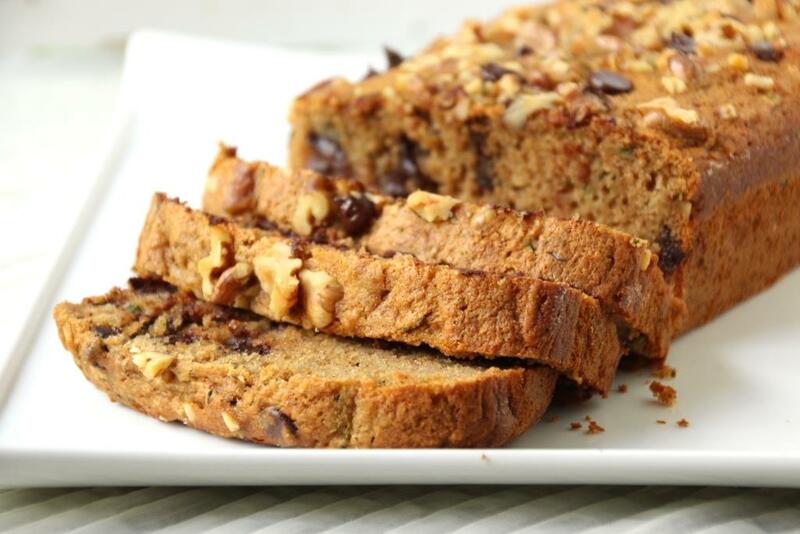 It’s sweetened with honey and a few chocolate chips, but maintains a much less decadent flavoring than your typical sugary quickbreads. You can obviously increase the chocolate chips if you want, but I felt this amount was plenty. Even with 30% less sugar than the original recipe, it still functions just as well as a dessert as it does for breakfast or an afternoon snack. Krista’s recipe called for walnuts, but I never put nuts in baked goods as I don’t care for the textural juxtaposition of soft bread and crunchy nuts if I’m not emotionally prepared for it. However, this time I chopped a few walnuts and sprinkled them on top, and it was a wonderful, crunchy addition to the bread. It’s a method I may use in the future for banana or pumpkin bread to give it a little something extra. If you don’t like walnuts, pecans or sliced almonds would work great too, or you can leave them off entirely, of course. Preheat oven to 350 degrees Fahrenheit. Grease (butter, coconut oil, PAM, whatever) and flour a loaf pan, shaking out excess flour. Set aside. If you haven’t already, use a cloth or paper towels to squeeze as much excess water from your zucchini as possible. Get your upper body workout here, if your zucchini is drier your bread is less likely to have wet spots in the middle. Set aside. In a medium bowl, whisk together flour, cinnamon, baking powder, baking soda, salt, and nutmeg. Set aside. In a separate microwave-safe bowl, combine honey and coconut oil. If they are not already liquid, heat 20-30 seconds and whisk until smooth. It’s okay if there are some small bits of coconut oil still solid. Add applesauce, egg, and vanilla, and whisk until completely combined. Slowly pour wet ingredients into dry ingredients, stirring (I used a rubbed scraper) until completely combined. 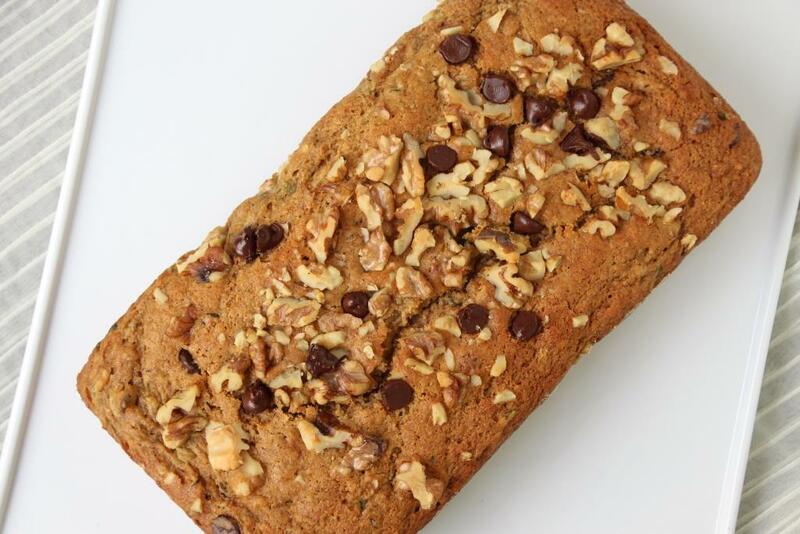 Fold in zucchini and 1/3 cup chocolate chips, then pour into prepared loaf pan. 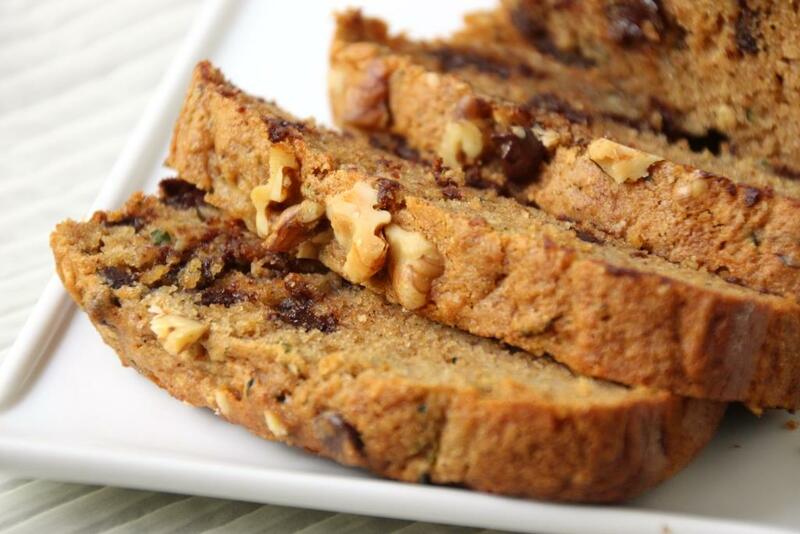 Sprinkle with remaining chocolate chips and walnuts, if using. Bake 50 minutes, or until a toothpick comes out clean. Let cool most of the way in baking pan, then run a knife along the edge and turn out onto a cooling rack to cool completely, or slice and serve pronto because it smells way too delicious to wait. Store completely cooled leftovers in an airtight container on the counter. Just kidding, until last weekend it has mostly been pouring rain and howling winds here. I will admit it’s made for some pretty challenging runs during my marathon training. Turns out 20 miles in drenching rain and/or 20-mph headwinds is not super awesome. I know, shocker. Regardless, around March I started thinking about lemons again, partially because my grandmother loved lemon meringue pie and her birthday was in March, and partially because Costco starts carrying giant bags of the wonderful yellow fruit around April. With the closing of ski resorts and the flowering trees, lemon just seems like the right flavor for the season. After making a large batch of granola, I was left with several egg yolks chilling in my fridge. My usual go-to for egg yolks is just to throw an extra one in scrambled eggs, but I didn’t think I’d get through them all that way very quickly. Secondary method is always pudding, but pudding sounded a bit heavier than the dessert I was really looking for. Enter: mousse! Substantially lighter in texture without compromising the ka-pow of flavor, mousse always feels like the summery version of pudding. Obviously lemon was the way to go. I cut Mandy’s recipe in half, very slightly adjusted it, and was on my way to a tasty treat. Her recipe called for a graham cracker crust that I’m sure is delightful, but I wanted to test an idea I’d been pondering. Last fall I’d seen some great ideas (on Pinterest, of course) using cookie spoons, which I thought were super cute. However, I am not a huge fan of sugar cookies and even more importantly, I don’t enjoy making them. I was curious whether the same idea would work with pie crust, and that seemed like the perfect delivery mechanism for lemon mousse. After texting my mom and asking whether she thought my spoons are oven safe (which I’m sure made her raise an eyebrow), I made some pie crust, made a mini spoon template with parchment paper, and begin cutting away. 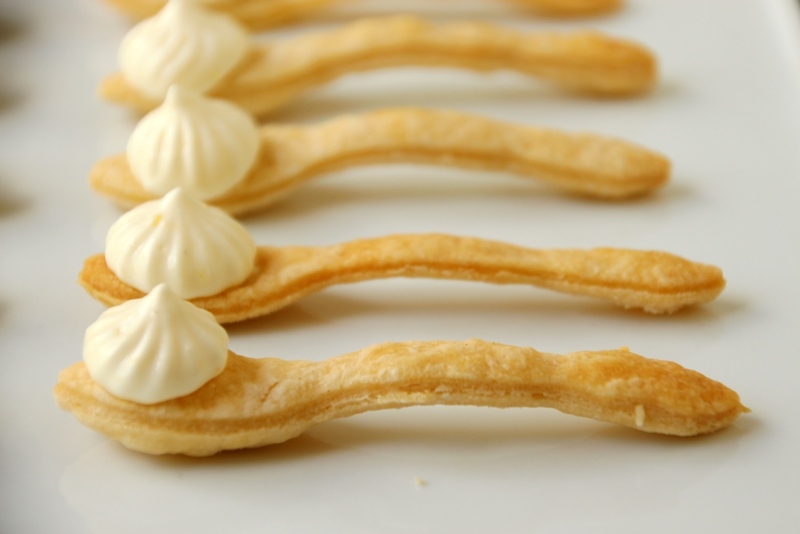 They baked up super cute and although they are a bit fragile, they work great for a dollop of mousse or for dipping. Although it didn’t take terribly long to cut by hand, for round two I bought a cookie cutter on Amazon, which was not only faster, but allowed me to be more efficient with the dough. Plus now I have a reason to make more spoon desserts. 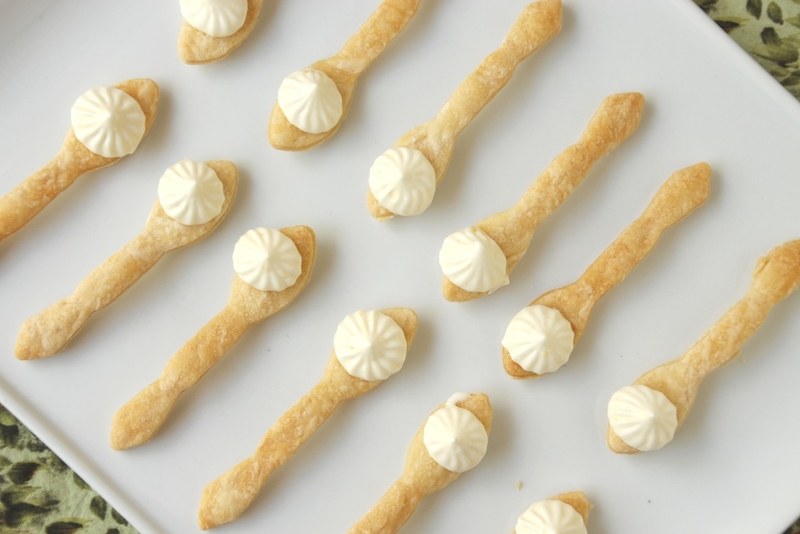 These lemon pie spoons are small, light, and require no cutting and slicing and plating, which makes them great for potlucks. Big lemon flavor and flaky pie crust come together in a delicious bite-sized treat. It’s important to use a pie crust recipe you like the flavor of, as it’s rather prominent given the somewhat higher crust:filling ratio. I’ve linked mine below, but feel free to use your own. This would be a fun confection for a summer barbecue where you don’t want to worry about fridge space. 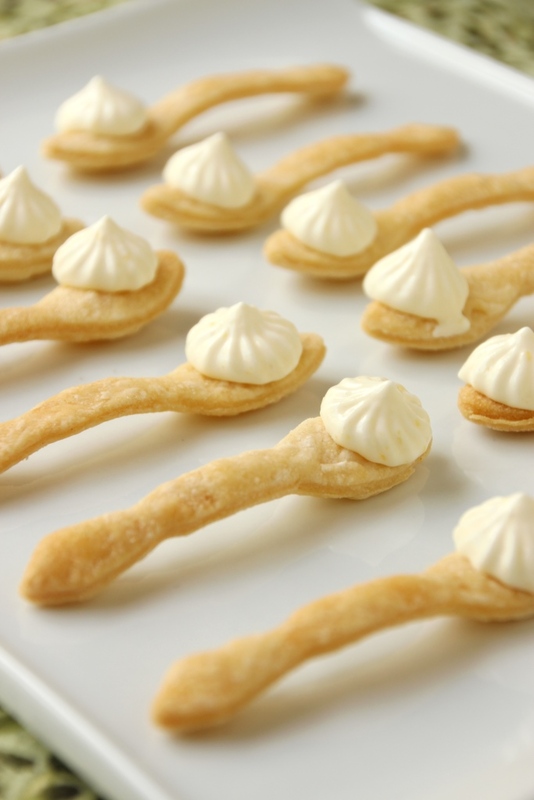 You can make the spoons and the mousse a day or two ahead of time (store the spoons on the counter, and the mousse in the fridge), then assemble shortly before you head to the party. They’ll be fine on the counter (inside, if it’s hot) for several hours, leaving you free to enjoy the party. Although they might droop a bit, they are definitely safe to eat. Fair warning: they are addicting! Make a batch to share, assuming you don’t eat them all yourself. For the spoons: Preheat oven to 425 degrees Fahrenheit. On a large baking sheet, arrange as many oven-safe spoons as you can fit. (A silicon mat will help them slide around less, if you have one.) Set aside. On a floured surface, roll out your pie crust to about 1/8″ thick. 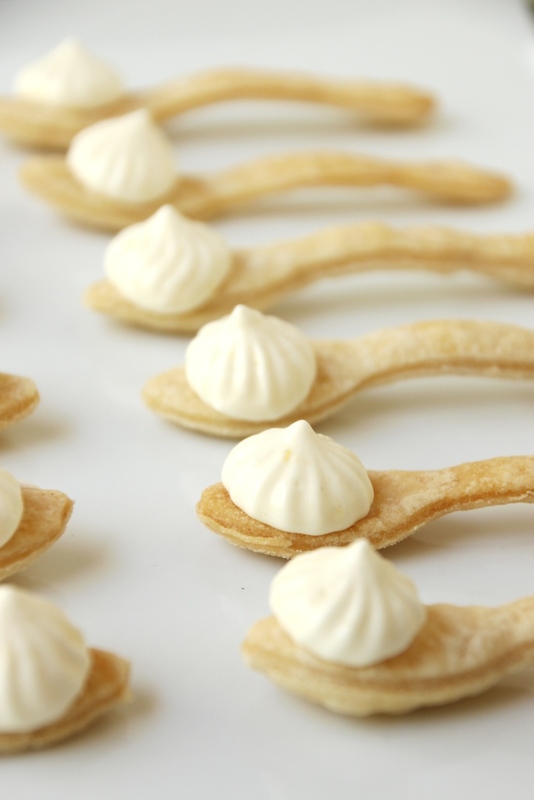 Use a cookie cutter (or a paper template and a sharp knife) to cut out as many spoons as possible. Pile all trimmings together, then gently roll out again and cut more spoons. Carefully transfer each pie crust spoon to a real spoon on the prepared baking sheet, pressing the dough into the real spoon’s indent. Bake 10-15 minutes, until crust is golden and slightly puffy. You may want to rotate the pan halfway through if your spoons are of different heights. Let cool a few minutes on the spoons, then gently and carefully (the metal spoons are hot!) remove them to a wire rack to cool completely, and repeat until all pie crust is used. Store on the counter until ready to use, up to 3 days. Stir with a wooden spoon over medium heat until mixture thickens and turns cloudy. Continue cooking until it’s thick enough to coat the back of a wooden spoon (although it’ll look clear). Use a mesh sieve and strain the lemon curd into a small bowl. Refrigerate at least one hour, stirring a couple of times if possible, or until ready to use. Mixture should be cool to the touch. Also place a large mixing bowl and your beaters (or KitchenAid whisk attachment) in the fridge at this time. When curd is sufficiently chilled, remove large bowl and beaters from the fridge. Beat heavy cream on medium/high until stiff peaks form. Gently fold in the curd to the whipped cream until it’s not streaky. Return mousse to fridge until ready to serve, up to 3 days. 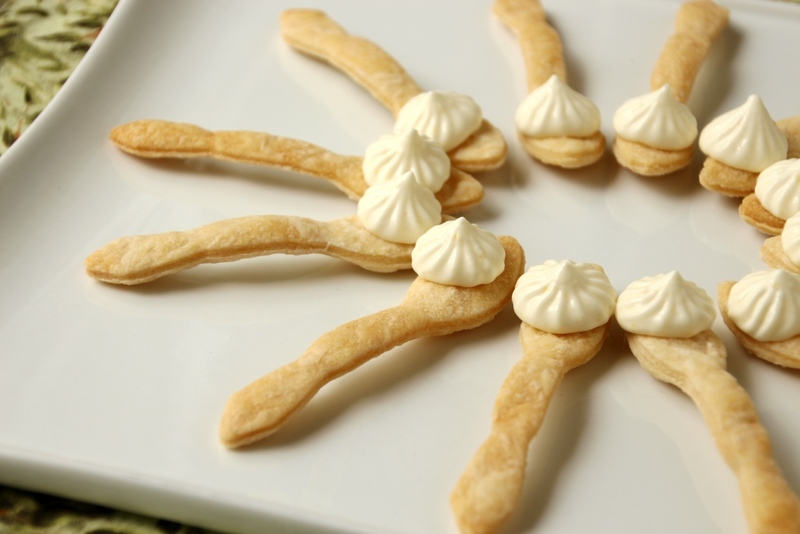 For assembly: Arrange pie crust spoons on a tray or serving platter as desired. Transfer mousse to a frosting bag with a star tip (or a Ziploc), cut off the tip, and carefully pipe onto the spoons. (You may have extra mousse.) Serve as soon as possible! Alternate assembly: Place mousse into 4-oz serving dishes and add a pie crust spoon. Serve with extra spoons for dipping! However, after an incredibly windy 10-mile run last Saturday, I decided to treat myself to something I hadn’t made in a long time: stuffed French toast. French toast is actually one of my favorite breakfasts but I rarely make it for no real reason other than I enjoy having leftover waffle batter for the next few days. Nonetheless, with some delightful potato buttermilk bread sitting on the counter and a dollop of cream cheese in the fridge, it seemed the perfect day for a more decadent confection. 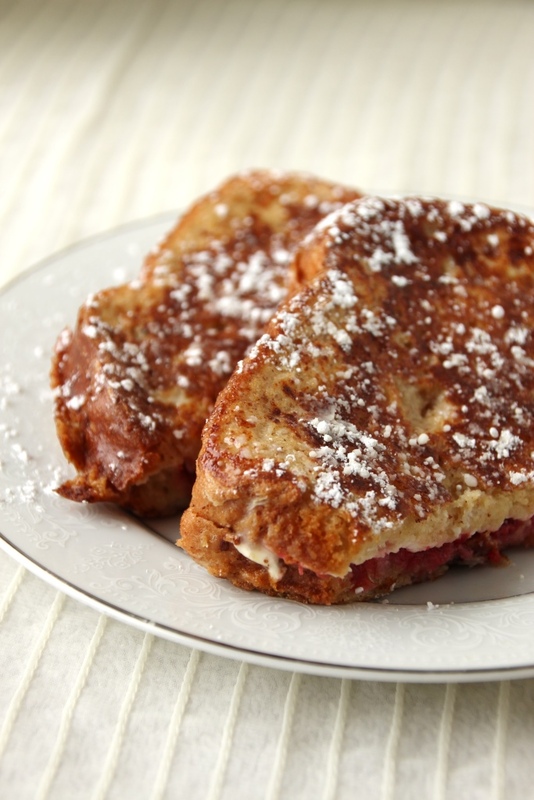 With melty cream cheese and my favorite jam in every bite, a thin spread of butter and a dusting of powdered sugar is all that’s needed to top this delightful creation. 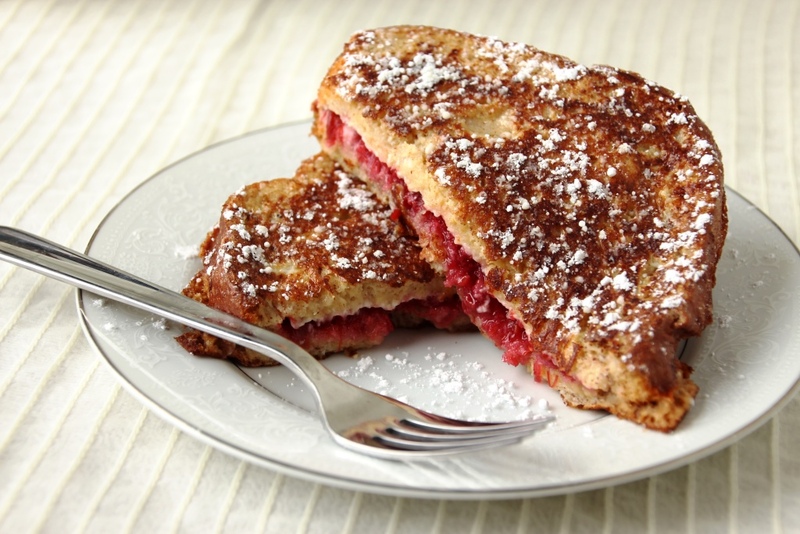 Even better, it’s no more difficult than regular French toast since basically you are just making cream cheese and jam sandwiches for your first step. It’s important to make sure your bread gets good and soaked with the egg mixture to ensure it results in a soft but golden brown bread to wrap those sweet insides. Fry on medium-low to make sure the cream cheese and jam gets nice and warm before the outside is overdone. The extra minutes of cooking is well worth the finished experience, I promise. If you’re looking for an extra rich option, top with a drizzle of maple syrup or homemade whipped cream, but just a little butter and powdered sugar is definitely my favorite. This is a great option for Sunday brunch (or Tuesday brunch, or any brunch, or dinner, I don’t judge), and sure to please your Valentine. Don’t have a Valentine? Be your own Valentine and please yourself with an amazing breakfast. Your morning cup of coffee is a perfect addition; a side of bacon and/or eggs balances the sweet with some salty protein. I’ve printed the recipe as a serving for one so you can make it as is or easily scale it up as needed to feed the whole family. It’s best hot off the griddle but if you’re cooking for more people than fits in one batch, you should be able to keep them warm in the oven so you can all eat together. 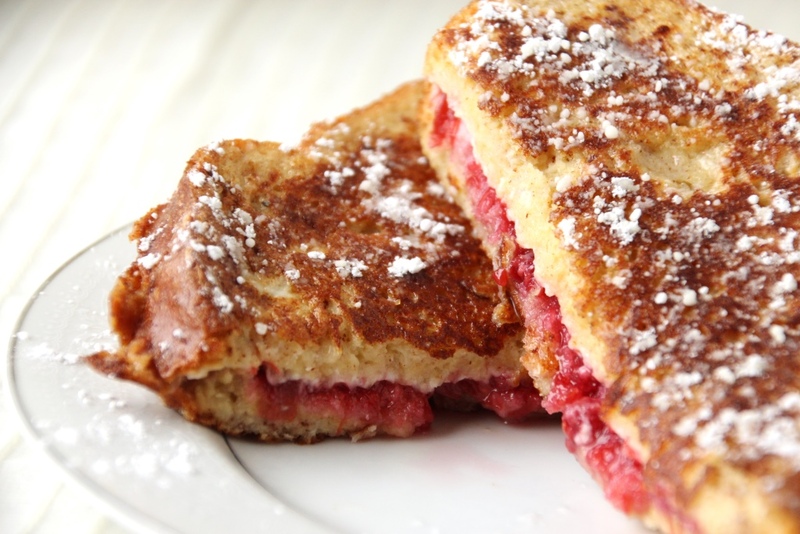 Whip up a batch of stuffed French toast this weekend for a special treat, then enlist those recipients to clean up your kitchen. It’s really the least they can do. Heat griddle or frying pan over medium heat and spray with non-stick cooking spray. 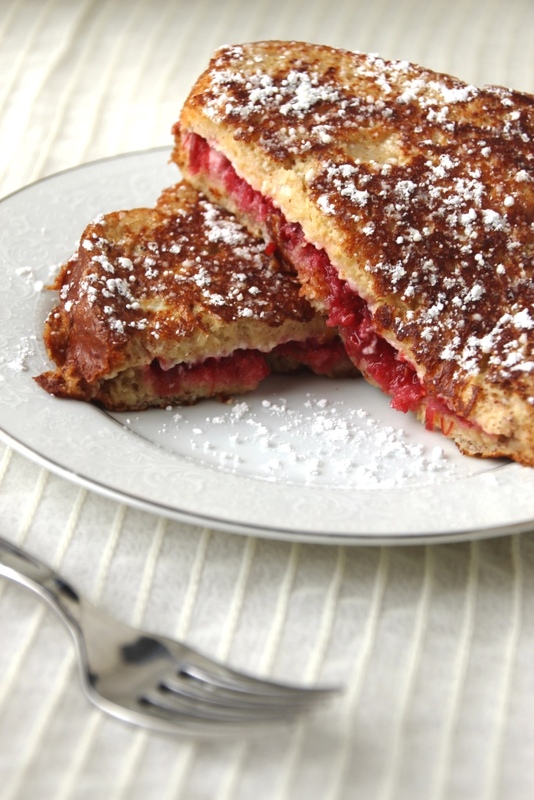 Spread cream cheese on one slice of bread, and jam on the other. Place cream cheese slice (spread sides together) on the jam slice to form a sandwich. In a shallow bowl large enough to fit your bread, whisk together remaining ingredients until well blended. Serve immediately topped with butter and powdered sugar, or a drizzle of maple syrup for an extra decadent treat. 1 You can use basically any jam or sauce, this one is just my favorite. As for the amounts, I like two tablespoons of each for a decadent filling, but you can certainly use less if you prefer a less rich breakfast. If your cream cheese is hard to spread, soften it in the microwave in ten-second intervals. It’s going to be heated anyway so if you slightly over-melt it that’s no big deal.